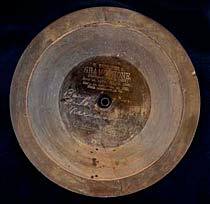 In 1887, Emile Berliner patented his disk-playing gramophone. It was a revolutionary improvement over Thomas Edison’s 1877 phonograph, which played cylinders. The disk format, cheap and easy to mass-produce, helped transform the talking machine from experimental novelty into commercial success. This early record is made of rubber, which Berliner used before settling on shellac as his material of choice. Today’s audio CDs are essentially digital versions of Berliner’s original gramophone record, with encoded “grooves” read by laser instead of needle. In the 1930s, the American chemical firm E. I. du Pont de Nemours sought to tap into the lucrative hosiery market by developing a synthetic alternative to silk. Years of testing by teams of scientists resulted in nylon, a polymer that was stronger and more durable than silk and could be applied to everything from parachutes to toothbrushes. 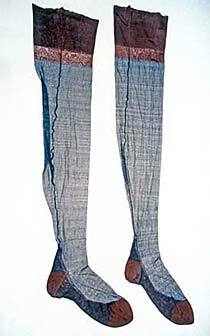 These experimental stockings made of nylon, cotton, and silk were produced two years before DuPont unveiled its “miracle fiber” at the 1939 World’s Fair. 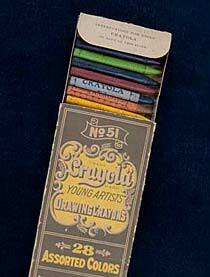 This Crayola set for “young artists” was one of the earliest produced. Its twenty-eight colors included celestial blue, golden ochre, rose pink, and burnt sienna. 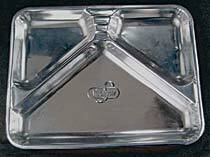 Made of shiny aluminum with compartments for meat, vegetables, and whipped potatoes, this early TV Dinner tray symbolized a square meal for the television age. Introduced by C. A. Swanson & Sons in 1953, the frozen, precooked dinner could be heated and ready to eat in twenty-five minutes. The meals were named to emphasize their modern, convenient design—as easy to prepare as turning on a television set. Portable and self-contained, TV Dinners also made it easier for 1950s families to combine dinner with their new favorite pastime.